At our East End Women Take Action event in September 2016 I gave a talk about the East End Federation of the Suffragette, founded by Sylvia Pankhurst in 1914, and how they used the media to support their activism. You can watch a video of my talk below, filmed by lovely volunteer Bea Moyes. East End Women's Museum Event: Sarah Jackson. I wish the Government joy in its efforts to get this money from the people of Poplar. Poplar will pay its share of London's rates when Westminster, Kensington, and the City do the same. Minnie Lansbury was born in Stepney in 1889, one of seven children in a Jewish family who came to London to escape poverty and persecution in Russia. Her father, Isaac Glassman, was originally a boot finisher but later became a coal merchant. In 1913, Isaac paid the £5 fee to become a British citizen, entitled to vote. In 1914 Minnie married Edgar Lansbury, son of local MP George Lansbury. Minnie became a teacher in a local London County Council school, earning £7 a month. She joined the National Union of Teachers and became involved in union activism, calling for equal pay for women among other things. She also joined the central committee of the East London Federation of the Suffragettes and played a key role in their campaigns and community actions. During the First World War Minnie became chair of the War Pensions Committee and used her role to protect the welfare of war widows, orphans, and the wounded. After the War Minnie was elected alderman on Poplar Council. In 1921, she was one of five women who, along with their male colleagues, were sent to prison for refusing to charge full rates from their poor constituents. Although the Poplar Rates Rebellion was a success, while in prison Minnie caught pneumonia and never fully recovered her health. On 1 January 1922 she died, aged just 32. Her death was announced at a thousand-strong meeting at Bow Baths Hall: "The audience for a moment was stricken silent... Then out of the silence came a woman's cry of grief, followed by the weeping of many women." The meeting was abandoned. Minnie, in her 32 years, crammed double that number of years' work compared with what many of us are able to accomplish. Her glory lies in the fact that with all her gifts and talents one thought dominated her whole being night and day: How shall we help the poor, the weak, the fallen, weary and heavy-laden, to help themselves? When, a soldier like Minnie passes on, it only means their presence is withdrawn, their life and work remaining an inspiration and a call to us each to close the ranks and continue our march breast forward. Hackney Museum and the East End Women's Museum are joining forces to tell the story of women who have led political and social change in Hackney. 2018 will be 100 years since some British women first won the right to vote. To mark the occasion an exhibition exploring how women in Hackney have changed society both with and without the vote will be on display in Hackney Museum. We are holding an event for anyone who is interested to share their ideas and tell us what they would like to see in the exhibition. You can also find out about joining the team of volunteers to create the exhibition, helping to uncover hidden stories by exploring the borough’s rich archives. The community forum will be held at Hackney Museum, 1 Reading Ln, London E8 1GQ on Thursday 21 July 6 – 7.30pm, no booking required. Join the Facebook event. There are lots of ways to get involved, and no prior experience is needed – just enthusiasm! Jessie Payne and her husband Jim cared for Sylvia Pankhurst at their home at 28 Ford Road when she was recovering from being force fed in prison. The Paynes had a daughter with a learning disability, but she had died when she was young. Sylvia described the couple as “the kindest of kind people”. Once when my girl was taken bad she went into the Poplar Workhouse, because I thought I was compelled to let her go. We come from the East End and we have the voice of the people, they want us to ask you to give the vote for every woman over 21. Jessie Payne also played an important role in the suffragettes' war relief work, launching the drive to distribute milk to families with starving infants. Nellie Cressall was born in Stepney in 1882, and worked in a Whitechapel laundry from her teens. She married George Joseph, and together they had six children. In 1907 Nellie joined the Independent Labour Party, and remained active in the Party all her life. I had been thinking for some time of the unequal rights of men and women. I could not agree that men should be the sole parent, that a mother could not even say whether her child should be vaccinated or not – or that women should receive half pay and many other things as well. I thought that here is something I can dedicate myself to to help in some way to put things right. Like many of the East London Federation of the Suffragettes Nellie was a pacifist and opposed the First World War. And like her fellow suffragettes Minnie Lansbury, Julia Scurr, and Jennie Mackay Nellie was one of the Poplar Rates Rebels of 1921. After the Poplar rebellion Nellie Cressall continued her work as a Labour Party activist, becoming Mayor of Poplar in 1943. Years ago after the First World War many, many people in my constituency sat in the dark because they had not got a penny to put in the gas. Today what do I find? People come to me creating about the heavy electricity bills they have to pay!... I have young people coming worrying me for houses.... We have got some houses where six families lived once upon a time.... Whereas in the old days people would get married, as I did, and be contented in two nice little rooms, today our young people want a home of their own. Her speech “roused the audience to prolonged applause and cheering” and drew praise from Aneurin Bevan, who said her speech was the finest at the conference. We're Not Finished is a free exhibition about women's activism in East London created by Eastside Community Heritage in partnership with the East End Women's Museum, on display at Whitechapel Idea Store from 21 March until 21 April. The exhibition includes fascinating oral histories drawn from interviews and workshops which illuminate the experiences of women fighting for change in East London. The aim of the project is to help establish a history of women campaigners in the East End. One of the main groups featured is the East London Federation of Suffragettes (ELFS), a radical group founded by Sylvia Pankhurst in 1914 in Bow. Sylvia separated from the work of her mother and sister in the WSPU as she believed that working class women had as much power as middle and upper class women in the fight for suffrage; Emmeline and Christabel Pankhurst did not agree. The ELFS membership was made up of and focused on issues relevant to working class women; they built a mass movement for equality and campaigned on many issues beyond the vote. But we’re not finished. Over the last century and today there are still issues of inequality, often in the workplace. Another area which the exhibition focuses on is women's fight to secure working rights - equal pay, maternity rights, better conditions, challenging sexist discrimination - and participation in the trade union movement. The exhibition will launch with an event on Monday 21 March at 5.30pm with speakers, refreshments, and activities related to the themes of the exhibition. More details coming soon! The East End Women's Museum project had a brief hiatus before Christmas for house-moving and business-starting. Since then we've been doing some research into governance structures and possible funding sources, and we've got some ideas we're really excited to share with you soon. Watch this space! East End women have changed the world. From the match women of Bow to the Ford factory machinists of Dagenham, the women of East London have fought for their rights, their beliefs, their families and their communities. 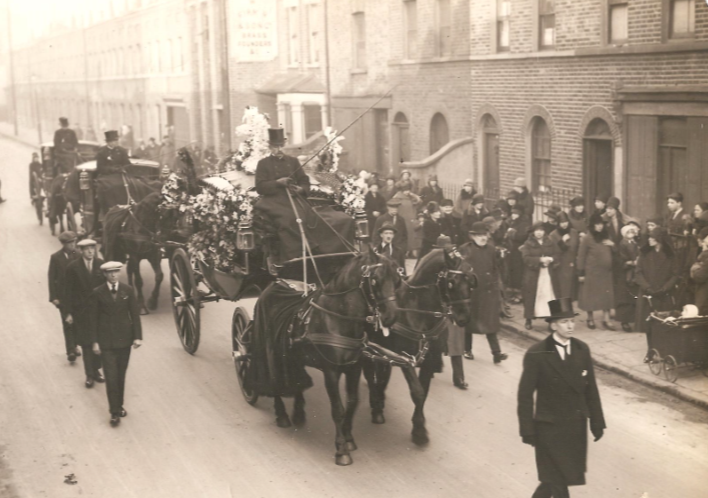 We're working in partnership with local charity Eastside Community Heritage to organise a series of school and community workshops and an exhibition about the East End's inspiring women activists. Please help us tell their story by contributing to the project crowdfunder. If we hit our target of £800 the full cost of the workshops will be covered! We've just passed the £500 mark and have one week left to raise the rest. Please donate today! Have you (or has someone you know) been involved in a local campaign or a protest? ECH are looking for people to interview. Please contact kirsty@ech.org.uk to help make history! In November we worked with a great team of volunteers to organise a vigil for International End Violence Against Women Day, commemorating the women who were killed in the 1888 Whitechapel Murders. The vigil was followed by a moving service at St George's-in-the-East, just off Cable Street. We're also working with the team on a women's history exhibition which will go on display in the church from May, and a series of events in March. It's not too late to get involved! Email womensmuseum@stgeorgesintheeast.org if you'd like to volunteer. Find out more. We were chuffed to join the steering group of the In Her Footsteps project led by Share UK, working with volunteers to develop a walking tour app exploring the history of women-led activism in Hackney, Tower Hamlets and Waltham Forest. The app will be developed over the next few months, launching with an exhibition and some great events in the summer. Sign up to the project's email list for updates, or contribute your story! If you're planning or working on a community history project about women in East London we'd love to hear about it and help if we can. Please get in touch! We're working with a fantastic local charity called Eastside Community Heritage to record and share the stories of East End women who have been involved with protests to advance and protect the rights of workers. Did you have a suffragette or a match woman in the family? Have you taken part in actions for equal pay or fair wages? Have you walked out on strike? ECH are looking to interview people about their memories, and excerpts from these interviews will be shared online and at a small public exhibition in March as part of Women's History Month.